It supports finnish and global weather in english, swedish and finnish language. Current version on notabug.org: https://notabug.org/ohnonot/conky-itl-weather. I have always sympathized your weather project. i'm using it on my own desktop. that's a nice compliment (supposing you mean the actual code). thanks. I used once month ago you, really impressed me, (but not only), your code gave me some ideas how to make mine as well. Anyway, currently i'm simply using conk-cli for panel but I could not stay hidden without mentioning my opinion about your work. I've been all over the place and totally missed this, ohnonot. My appologies. So good to have your weather script here, a new home. and no apologies, what for! some changes to the website required me to act. Items here are over a year old. Still working? Sorry, I was out for the summer, just came back yesterday (and finally it's warm in Hki, too :-). oh yes, it is still working, and will continue to do so because i use & depend on this myself. i am planning to overhaul the whole thing, atm it's overly complicated, but it does work as it is. 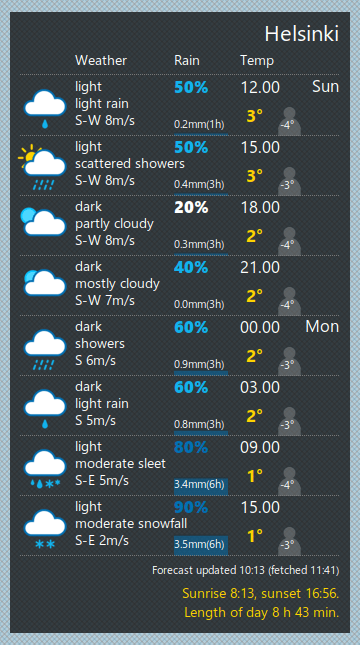 Nice work by the way , how do i find the weather for Stephens City VA , http://ilmatieteenlaitos.fi , cannot find it. Observations are not in international weather. Ten-day forecasts are available for a slightly wider area. In Western Europe the boundary lies north of the 51st parallel, while in Eastern Europe it is slightly further to the south. In Russia the area extends east of the area for which precipitation probability forecasts are available. There are predictions for major resorts (for finnish travelers), like Bangkok, LA or NY, but you can't find Washington DC, for example. Luckily webs are loaded with weather conkies. Have you already found Conky weather+moon scripts (Accuw/WUndergr/NWS/MoonGiant) by Teo? edit misinformation: Washington is there, but not in english version of the site (http://ilmatieteenlaitos.fi/saa/dc,%20y … washington). For Stephens City it shows New York. 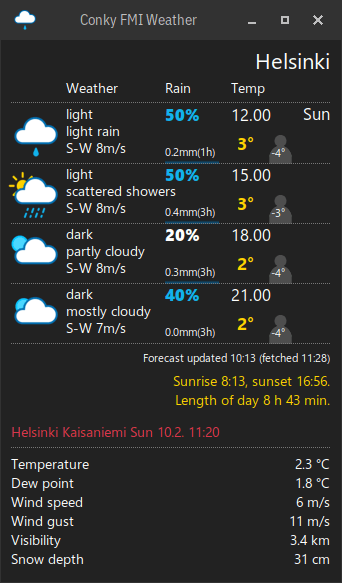 the finnish metereological institute's online forecast supports three languages: english, swedish, finnish. it provides weather data in decreasing density for: Finland, the nordic countries, europe, the rest of the world. i created it because i think one should use a weather forecast service that is physically close. Best: finally new icons! because of potential licensing issues, better to download them yourself. script provided. cleanup & overhaul continues, then suddenly the website changed itself. I was also able to do some testing on Xubuntu 16.04 and Bunsenlabs Helium. Not much in looks, but thanks to this (thanks johnraff) I felt inspired to finally overhaul the configuration file functionality and a few other things while I was at it. I believe the configuration options are a little clearer and simpler now. I'm especially proud of the toggle/reload functionality, bound to a hotkey I can invoke the weather forecast and update or kill it. Eyecandy: the window icon is updated to the current weather icon! After hacking on this for a full day, it took me another half day to update the ReadMe... the weather really is crappy atm, even walking to the cornershop is an ordeal. Best to stay at home and do some amateur coding.